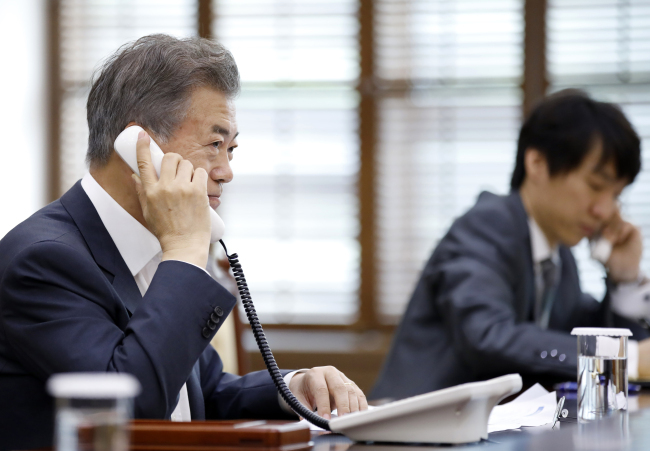 South Korean President Moon Jae-in is set to engage in a flurry of diplomacy this month as he tries to maintain the momentum of the inter-Korean summit until the US-North Korea talks which are expected to take place in May. The first order of business is the trilateral talks among South Korea, China and Japan, scheduled to be held in Tokyo on May 9, where Moon will brief Japanese Prime Minister Shinzo Abe and Chinese Premier Li Keqiang on the outcome of the inter-Korean summit. The meeting will also see the leaders discuss ways to strengthen three-way cooperation in denuclearization of the Korean Peninsula and establishing lasting peace, according to Cheong Wa Dae. Following the trilateral meeting, Moon will separately hold a bilateral summit with Abe. If Washington and Pyongyang reach an agreement on denuclearization, the Panmunjeom Declaration of April 27 is expected to gain momentum. If their talks fails, tensions between Pyongyang and Washington will likely escalate. Following the planned North Korea-US summit, there is a likelihood of a three-way meeting involving the two Koreas and the US, or a four-way meeting involving the two Koreas, the US and China to be held in June to push for the declaration of the end to the Korean War. In addition, with Russian President Vladimir Putin having requested a state visit by Moon in June, a Seoul-Moscow summit is also in the works. Russia is eyeing three-way cooperation among the two Koreas and itself to build rail lines and gas pipelines passing through the isolated country. As Moon steps up his diplomatic push to resolve the standoff over North Korea’s nuclear weapons programs, China and Japan are seen scrambling to engage with North Korea to dispel concerns that they are being sidelined in the fast-paced denuclearization talks. China’s Foreign Minister Wang Yi is set to visit North Korea from Wednesday to Thursday at the invitation of North Korea’s Foreign Minister Ri Yong-ho. They are expected to discuss recent developments surrounding North Korea, as well as Xi’s planned visit to the North. China, North Korea’s traditional ally and biggest trading partner, has tried to improve its frayed relations with Pyongyang in recent months, in what appears to be a move to dismiss concerns that it is being left out of critical decisions on the Korean Peninsula and losing its influence over the North Korean regime -- a key point of leverage over the US. Beijing’s relations with Pyongyang have been strained due to its backing of international sanctions against the reclusive regime over the North’s nuclear weapons programs. Another source of concern for China might be that Moon and Kim agreed to discuss declaring an end to the Korean War, possibly without China. The two sides said they would seek to hold three-way talks among the two Koreas and the US, or four-way talks involving China. Tokyo also delivered its intention to hold a summit with Pyongyang, Asahi Shimbun reported, quoting anonymous diplomatic sources. It reported that Japan-North Korea summit may take place shortly after the US- North Korea meeting. Japan, which has been at the forefront of the US-led maximum pressure campaign against North Korea and remains skeptical about the North’s recent peace overture, appears to be increasingly isolated amid a thaw in relations between North Korea and the outside world. Japan has its own pressing task to resolve: the issue of Japanese nationals abducted by North Korea. Japan has asked South Korea and the US through various channels to address the issue during their respective summits with North Korea. North Korea is accused of having abducted 17 Japanese nationals in the 1970s and the 1980s.